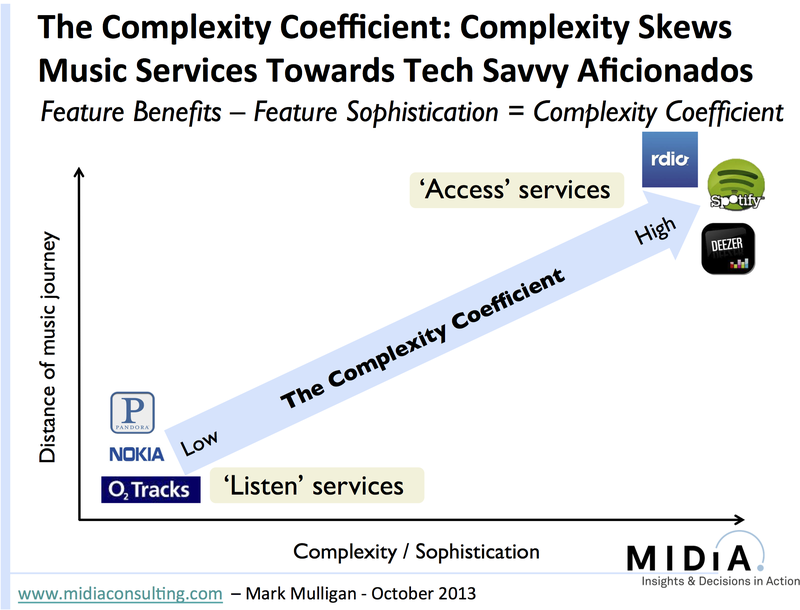 Regular readers will recall my classification of the digital music market into Access services and Listen services, located at opposite ends of the Complexity Axis. Late last week two of those Listen services upped their respective games, with MusicQubed launching a new service with Vodafone New Zealand and Nokia Mix Radio introducing a host of new features. Both services are focused squarely on delivering elegantly simple music experiences for as little effort as possible from the listener. All you can eat Access services have done a great job of engaging the higher end aficionado and will continue to be the most appropriate business model and value proposition for the more engaged, higher spending music fan. They do little for the lower spending mass market consumer however, which is where Listen services come in. Interestingly MusicQubed and Nokia’s announcements came in the exact same week that news began to surface of Spotify securing an extra $250 million in finance, taking Spotify’s total investment tally to over half a billion. In fact Deezer and Spotify alone account for approximately two thirds of all of the investment in digital music services in the last three years, amassing $0.6 billion between them from 2011 to 2013 alone. Both companies have reported impressive subscriber counts and have made subscriptions work at scale in a way that the stalwart incumbents Rhapsody and Napster never did. But building the Access business is clearly one that requires a large and steady influx of working capital. The industry has got to hope that the investment to date helps build the foundations of long term sustainability and not simply supercharge a few services for a quick sale without an eye fixed firmly on the long game. Concerns aside, it is great to see more investment pouring into the space, even if it is too concentrated at the moment. It is even more encouraging though to see more companies recognising the need to engage the less hip, but much larger installed base of mass market fans who are currently getting left behind by the digital music bandwagon. It is to be hoped that these are the foundational signs of a more mature digital marketplace that can take the digital transition onto the next stage. Despite commendable progress the digital music market is still way behind where it should be. It is an easy mistake to view the global music market through the Anglo-American lens but if you strip out the UK and US from the statistics the result is that three quarters of global ‘rest of world’ music sales are physical. Thus ten years since the launch of the iTunes Store digital is still only a quarter of non-US and UK revenues. The role of Apple is, as ever, key: Apple knew how to make an elegantly simple user experience that just worked. Thus where Apple was strongest (US and UK) digital music sales prospered. But most consumers do not have Apple devices so the music industry needs more music services to be as elegantly simple as iTunes if it is going to push the needle on that 25%. The problem is that most of the services on which industry hopes are being pinned are anything but. Streaming subscription services are undoubtedly at the leading edge of music technology sophistication and recent innovations from Spotify in particular are setting the bar high for immersive digital music experiences. But paradoxically this is part of the problem. 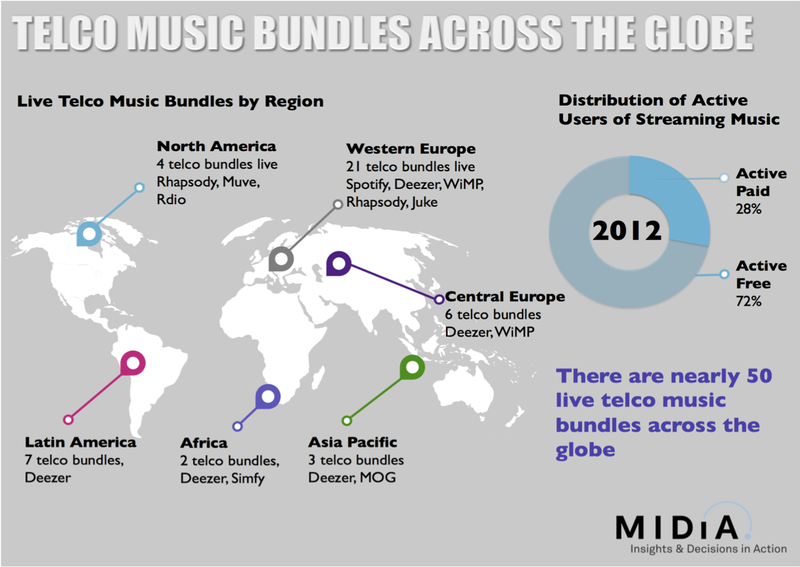 At the end of 2012 subscription and ad supported services accounted for just one fifth of global digital music revenues. Though that number will grow markedly in 2013 – and already over indexes in the digital sophisticate Nordic and Dutch markets – it will not overtake downloads anytime soon. There are of course many factors, including the key issue of pricing – 9.99 is not a mass market price point, but there is a more fundamental one: streaming subscription services are just too sophisticated for mainstream users. The reality is that mainstream music consumers are not heavily engaged with music and like programmed, curated music experiences. For all the music industry turmoil of the last decade radio listening has remained relatively steady, even growing in many markets, and it also remains the number one music discovery source – still far ahead of YouTube. Radio’s enduring popularity stems from its simplicity. A common product strategy error is the assumption that more features = better quality product. But more often than not, less = more. The extra discovery features in subscription services are fantastic tools for the niche audience of engaged music aficionados that use these services but they also make them less accessible for mainstream users. This is what I term the Complexity Coefficient. In short, the more sophisticated the features of a service, the less the benefits will be felt by the user. When this is applied to less sophisticated users a multiplier needs to be applied: a heavily featured sophisticated music service will already have barriers to use for an aficionado but will be entirely inaccessible for a mainstream user. The Complexity Coefficient manifests itself in another way also: the more complex a service, the longer the music journey is. For music aficionados that can be a good thing, but for radio-centric mainstream users it is a barrier rather than a benefit. When we apply this thinking to the digital music landscape something really interesting emerges (see graphic). The on demand subscriptions that monetize access – ‘Access Services’ – sit at the top right, highly sophisticated, but therefore also complex, with the longest music journey. These services provide access to a vast, vast catalogue of music. A catalogue that is growing rapidly every single day. Last week 7Digital’s Ben Drury reported that his company now has 27 million tracks in its catalogue and is growing at a rate of 100,000 a week. Choice is fantastic but too much begets choice paralysis. There becomes so much choice that there is effectively no choice at all. This is the Tyranny of Choice. 27 million tracks is an unwieldy vastness of music that would take 205 years to listen to. What matters about music catalogue is the music that truly matters not the total size. Of those 27 million perhaps 3 to 6 million are ‘core’ catalogue. Of those how many really matter to any given listener? Perhaps 10,000 at the most? Even that would be 2 months of listening for someone who listens 10 hours a week and doesn’t listen to the same song more than once. With the growth in catalogue each ‘Access Service’ must get 100,000 tracks worth of being better at its discovery job just to stay as good as it was last week. And despite the vast progress that is being made, few would argue that there is a long way to go yet before we can come close to arguing that the discovery problem has been fixed. So the odds are against a worsening status quo not an improving one. But at the opposite end of the Complexity Coefficient scale a very different picture emerges. Here we have services like Pandora, MusicQubed’s O2 Tracks and Nokia’s Mix Radio delivering highly programmed, lean-back music experiences for the mainstream users, where the music journey is shortest. Whereas Access services give the user access to all the music in the world, Listen service take the user straight to the music that matters. One leads the user up the garden path, the other just opens the front door. But there is an overriding monetization issue at the lower end of the Complexity Coefficient: most of these services predominately generate revenue via advertising. The majority of Nokia Mix Radio’s and Pandora’s users are on free tiers. O2 Tracks is the exception, with users paying for all tiers of access (other than a free trial). In many ways the Access services are taking a TV broadcaster approach to discovery: they are trying to encourage users to discover as much new content as possible, to send the user on a rich journey of serendipitous discovery. The Listen services however are focused squarely on delivering a smaller selection of music the user is most likely to like, and keeping firmly within those parameters. To an aficionado the Listen service approach may feel restrictive and limited, but to a mainstream music consumer it fits their exact needs. But what is clear is that music services at the lower end of the Complexity Coefficient scale are going to be crucial for pushing digital music towards the mainstream. Welcome to the age of the ‘Listen’ service? 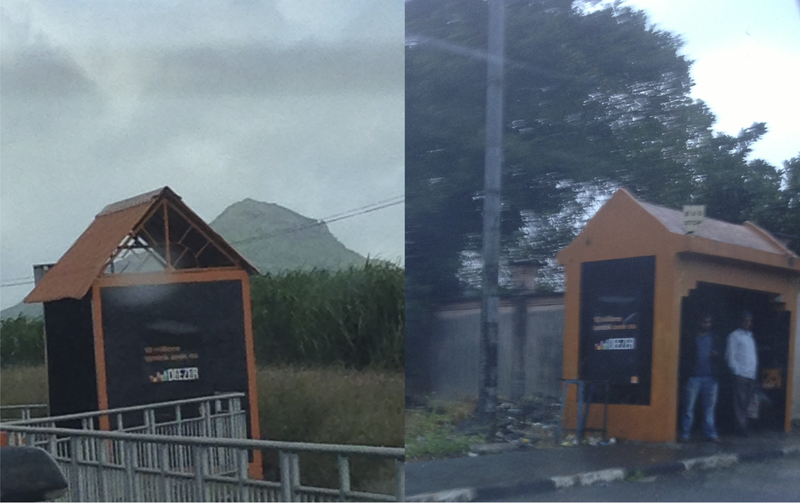 …and it means it: the pictures below are of Deezer branded bus stops in rural Mauritius. With Spotify also having announced a bunch of new markets this week, and Apple and Nokia already having an extensive network of global digital stores, 2013 really is the year that digital music should start to see some meaningful ‘rest of world’ traction. At Midem this last weekend Nokia announced the launch of Nokia Music Plus, a premium iteration of its free Nokia Mix Radio offering. For €3.99 per month subscribers get an enhanced personalized radio service including unlimited track skips, unlimited offline playback and lyrics streaming. From a pure specifications perspective none of that is particularly groundbreaking, but what is interesting is Nokia’s execution as a truly mobile first music service. Many digital content providers are positioning themselves as being mobile first these days, but the results often suggest they are anything but. Mobile first does not mean simply having most of your customer engagement happening via mobile, nor does it mean focusing your development costs on mobile, heck it doesn’t even mean only being available on mobile. None of these factors constitute being mobile first, instead they should be natural outputs of a mobile first approach, success indicators of a mobile first strategy. Being a mobile first consumer offering, at least if we use the term in a strategically meaningful sense, should be about meeting a consumer’s mobile needs in a uniquely mobile way. One that does not just leverage mobile functionality but instead has it at the core of its DNA. That creates an experience that is so good on mobile that it would be an inferior experience on a PC. Despite being a mobile company first, Nokia hasn’t always delivered mobile first experiences. Indeed one of the failings of the much maligned but nonetheless visionary Comes With Music was that it delivered a clumsy and squashed PC experience that masqueraded as a mobile music experience. But with Mix Radio, Nokia have delivered a truly mobile first experience that sets the bar for others to follow. There is nothing particularly revolutionary in the service, but that misses the point. Nokia have taken the Apple mantra of delivering elegant, seamless user experiences and have run with it. As the screen shots in figure one show, Mix Radio does not try to cram the screen with metadata and information but instead uses the screen inventory to deliver uncluttered, visually rich content. I’ve been trying out Mix Radio on a Lumia 920 (which by the way is IMHO Nokia’s best device since the N95 8 Gig. It is great to see that Nokia has got its hardware mojo back, let’s hope it isn’t too late). 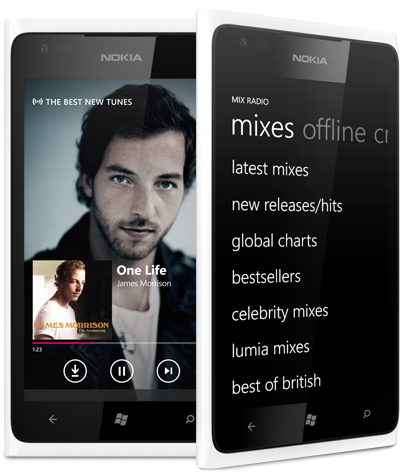 On the Lumia 920’s large screen, Mix Radio is a music experience that genuinely feels like a mobile music experience and that does not leave one wanting to switch to a PC screen as soon as is possible. It isn’t a perfect service, and I am not convinced that the beefed up Music Plus offering will get much traction as a premium offering, but it does set a standard for what a mobile first music experience should be. One other feature that Nokia launched on Saturday, but with little or no fan fare, is one of the most fun digital music features I have seen in years: NFC Activated Mixes. The user simply points their phone at one of the NFC targets (see graphic below) and a mix starts playing instantly as soon as the he or she accepts the mix. NFC music is far from a brand new concept but the value of the feature is again all in the execution: point, touch, play. All in an instant. And this isn’t just for promoting music, users can use NFC stickers to create their own mixes and leave them anywhere they like. It is also just as easy to dump a mix onto a sticker as to listen to one – with all the actual music files residing in the cloud so it is only metadata that is being transferred. And of course, it is again a genuinely mobile first experience. The opportunities for personal sharing as well as commercial uses are boundless. Cafes could have them at the counter so customers could chose a mix with their coffee. Bars and clubs could have them on their doors to give passing clientele the opportunity to hear what sort of music they can expect inside. (Use cases similar to those, by the way, that Swedish start up TunaSpot has also been working towards with its Spotify / 4 Square API mash-up app). Though only a small and fun feature, Nokia’s NFC Activated Mixes nonetheless represent the potential of a profound extension of music consumption: making location and context genuine parts of the music experience. Augmented Reality apps such as Layar have focused, understandably, on augmenting the visual world with mobile context, but this is Sonic Augmented Reality. The next obvious step for music experiences is to then blend sonic and visual elements, but in many ways that will detract from the elegant simplicity of Sonic Augmented Reality. Nokia’s NFC Activated Mixes work because they are quick, simple and non-intrusive. It is as easy as picking up a free newspaper from the stand at a train station, whereas traditional Augmented Reality apps require a strong degree of consumer involvement. Nokia are not necessarily reinventing the digital music market – after all they tried that with Comes With Music and got their fingers burnt through to the bone. But what they are doing is using the already available assets in the digital music landscape to set new standards in mobile first music experiences. Welcome back to the fold Nokia. Following the disappointment of 2010, 2011 was always going to need to pack more punch. In some ways it did, and other ways it continued to underwhelm. On balance though the stage is set for an exciting 2012. Subscriptions finally hit momentum. Though the likes of rdio and MOG haven’t yet generated big user numbers Spotify certainly has, and Rhapsody’s acquisition of Napster saw the two grandaddys of the space consolidate. Spotify hit 2.5 million paying users, Rhapsody 800,000 and Sony Music Unlimited 800,000. New services started coming to market. After a year or so of relative inactivity in the digital music service space, 2011 saw the arrival of a raft of new players including Blackberry’s BBM Music, Android Music, Muve Music , and Rara. The momentum looks set to continue in 2012 with further new entrants such as Beyond Oblivion and psonar. Total revenues still shrank. 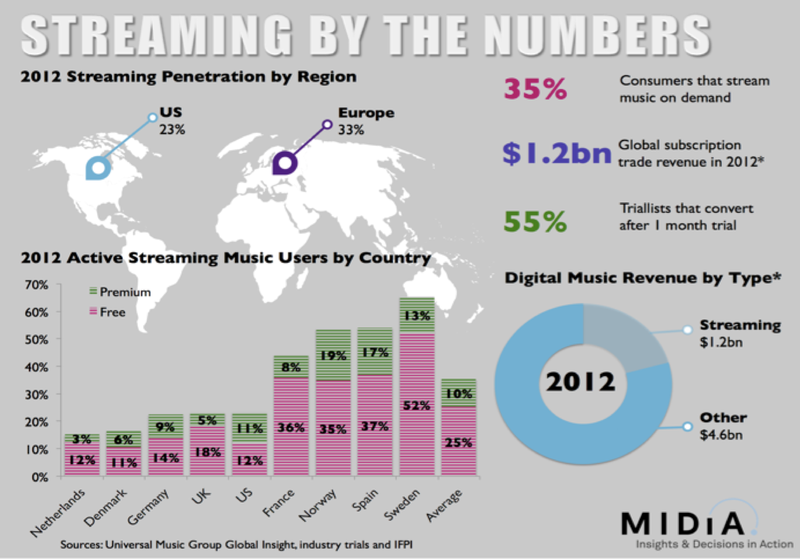 By the end of 2011 the European and North American music markets will have shrunk by 7.8% to $13.5bn, with digital growing by 8% to reach $5 billion. The mirror image growth rates illustrate the persistent problem of CD sales tanking too quickly to allow digital to pick up the slack. Things will get a little better in 2012, with the total market contracting by just 4% and digital growing by 7% to hit $5.4 billion, and 41% of total revenues. 2011. Arguably the biggest winner in digital music in 2011, Facebook played a strategic masterstroke with the launch of its Digital Content Dashboard at the f8 conference. Subtly brilliant, Facebook’s music strategy is underestimated at the observer’s peril. Without investing a cent in music licenses, Facebook has put itself at the heart of access-based digital music experiences. It even persuaded Spotify – the current darling of the music industry – to give it control of the login credentials of Spotify’s entire user base. Facebook’s Socially Integrated Web Strategy places Facebook at the heart of our digital lives. And it’s not just Facebook that is benefiting: Spotify attributed much of its 500,00 new paying subs gained in October and November to the Facebook partnership. 2012. Facebook is quietly collecting unprecedentedly deep user data from the world’s leading streaming music services. By mid-2012 Facebook should be in a position to take this to the record labels (along with artist profile page data) in the form of a series of product propositions. Expect whatever is agreed upon to blend artist level content with music service content to create a 360 user experience. But crucially one that does not require Facebook to pay a penny to the labels. VERDICT: The sleeping giant of digital music finally stepped up to the plate in 2011 and will spend 2012 consolidating its new role as one of the (perhaps even *the*) most important conduit(s) in digital music history. 2011. It would be puerile not to give Spotify credit for a fantastic year. Doubts about the economics of the service and long term viability remain, but nonetheless 2011 was a great year for the Swedish streaming service. It finally got its long-fought-for US launch and also became Facebook’s VIP music service partner. Spotify started the year with 840,000 paying subscribers and hit 2.5 million in November. It should finish the year with around 200,000 more. Its total active user base is now at 10 million. But perhaps the most significant development was Spotify’s Developer platform announcement,paving the way for the creation of a music experience ecosystem. Spotify took an invaluable step towards making Music the API. 2012: Expect Spotify’s growth trajectory to remain strong in 2012. It should break the 3 million pay subscribers mark in February and should finish the year with close to 5 million. And it will need those numbers because the funnel of free users will grow even more dramatically, spurred by the Facebook integration. But again it will be the developer platform that will be of greatest and most disruptive significance. By the end of 2012 Spotify will have a catalogue of music apps that will only be rivalled by Apple’s App Store. But even Apple won’t be able to come close to the number of Apps with unlimited music at their core. More and more start ups will find themselves opting to develop within Spotify rather than getting bogged down with record label license negotiations. Some will find the platform a natural extension of their strategy (e.g. Share My Playlists) but others will feel competitive threat (e.g. Turntable FM). If Spotify can harness its current buzz and momentum to create the irresistible force of critical mass within the developer community, it will create a virtuous circle of momentum with Apps driving user uptake and vice versa. And with such a great catalogue of Apps, who would bet against Spotify opening an App Store in 2012? VERDICT: Not yet the coming of age year, but 2011 was nonetheless a pivotal year paving the way for potentially making 2012 the year in which Spotify lays the foundations for long term sustainability. 2011. Though 2011 wasn’t quite the coming of age year for Spotify it most certainly was for Pandora. In June Pandora’s IPO saw 1st day trading trends reminiscent of the dot.com boom years. By July it had added more than 20 million registered users since the start of the year to hit 100 million in total and an active user base of 36 million, representing 3.6% of entire US radio listening hours. But Pandora also felt the downs of being a publically listed company, with flippant traders demonstrating their fear that Spotify’s US launch would hurt Pandora. 2012: And those investors do have something of a point: whatever founder Tim Westergren may say, Spotify will hurt Pandora. A portion of Pandora’s users used Pandora because it was the best available (legal) free music service. Those users will jump ship to Spotify. This will mean that Pandora’s total registered user number will not get too much bigger than 100 million in 2012 and the active number will likely decline by mid-year. After that though, expect things to pick up for Pandora and active user numbers to grow again. The long term outlook is very strong. Pandora is the future of radio. It, and services like it, will get an increasingly large share of radio listening hours with every month that passes in 2012, and with it a bigger share of radio ad revenues. Pandora will be better off without the Spotify-converts, leaving it with its core user base of true radio fans. Spotify’s new radio play will obviously be a concern for Pandora but this is Pandora’s core competency, and only a side show for Spotify. Expect Pandora to up their game. VERDICT: Since launching in November 2005 Pandora have fought a long, dogged battle to establish themselves as part of the music establishment, and 2011 was finally the year they achieved that. There will be choppy waters in 2012 but Pandora will come out of it stronger than it went in.